Most weekdays I skip breakfast. The stress of the morning rush puts me in no mood to eat. But on the weekends, I love to indulge in long, lazy breakfasts. This weekend while I made the girls pancakes, I decided to try something a little different for myself since I'm not a big fan of pancakes. The Hubs had just picked up a fresh loaf of bread from the bakery. I also had an avocado that I was craving. So, I decided to make avocado toast. I didn't have a recipe, just an image in my head of what I thought would taste good. 1. Toast the break until golden brown. 2. Remove toast from toaster and drizzle with 1/2 tbsp. of olive oil. 3. 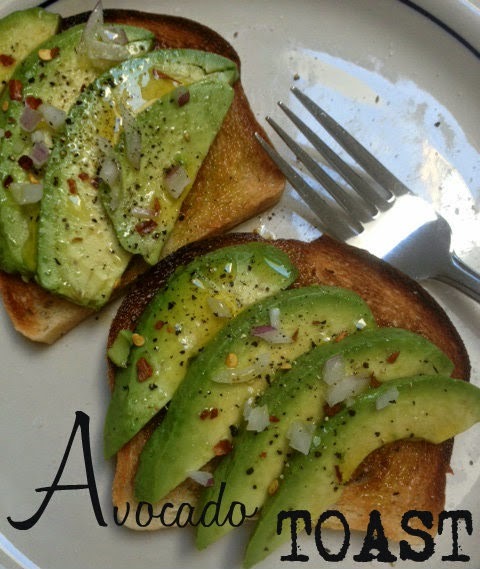 Arrange the sliced avocado on the toasted bread. 4. Sprinkle with salt, pepper, crushed red pepper. 5. Drizzle with remaining olive oil.